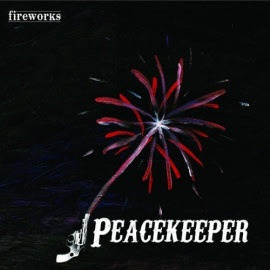 Local band Peacekeeper moved to Chicago from New Orleans in the summer of 2008, and have since released their debut LP, "Fireworks." The band describe themselves as part of a musical movement dubbed "gentleman rock," in which "a premium is put on good manners, cosmopolitanism and a generally genial attitude." "Just because you rock doesn't mean you have to drink Pabst Blue Ribbon in a filthy alleyway at 3 o'clock in the morning, right?," ask the band in their MySpace profile. You have to admire them simply for daring to refuse rock and roll cliches, but luckily their music is pretty great, too. Although "gentlemen rock" could easily describe their sound as well as their attitude, overall Peacekeeper is one of those acts you can't easily categorize. Lead singer, songwriter and piano player Kevin Corcoran sounds comfortable dabbling in a variety of styles, all rooted in down to earth, classicist pop. The band is at their strongest when they lean toward breezy, upbeat melodies, with the title track, "Ship in a Bottle," "Girl" and "New House" offering up the most memorable hooks and sounding like the musical equivalent to a Sunday afternoon in July. "New House" features a particularly soaring, ear-catching chorus that makes it stand out as one of the disc's finest. Elsewhere, they expand their sound via old-time Americana ("Lonely Waltz"), jazzy lounge pop ("Is This Love") and Southern-style classic rock ("Don't Hold Me"), and while these tracks aren't quite as convincing, they are still enjoyable and add welcome variety. "Fireworks" is the work of a band that isn't attempting to make your ears ring or rock your face off, but it's also a lot more than mere background music. Its best moments are examples of genuinely great, refreshing songwriting. If this is what gentlemen rock sounds like, hopefully we'll hear much more of it soon. You can get "Fireworks" on iTunes and Amazon MP3, as well as at select record stores in Chicago. Check out Peacekeeper live at Phyllis' Musical Inn in Wicker Park on March 20 and April 25.